Some color combinations always look good together, no matter the design. Others, you have to really search for the right project. Sky blue and orange are one of those finicky combinations. I realize it may not be everyone’s cup of tea, but I am so pleased with how my Daybreak shawl turned out. I haven’t been this happy with a finished object in a long time. The colors are so fun and happy to me. It reminds me of summertime. 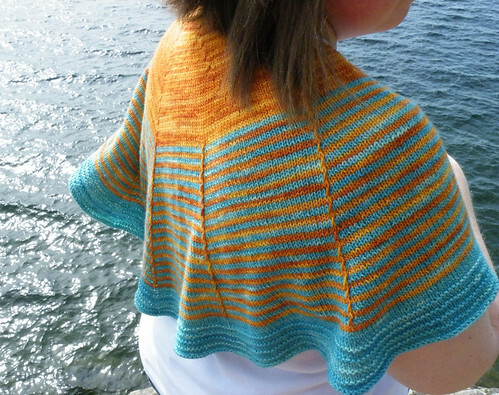 The yarn is Sundara sock in Robin’s Egg and Marigold. I used size 3 needles, and made the medium version. For as far back as I can remember I’ve been attracted to stripes, so don’t be surprised to see another one of these on the needles in the near future. I feel like I need a pink and brown version too! Wow! 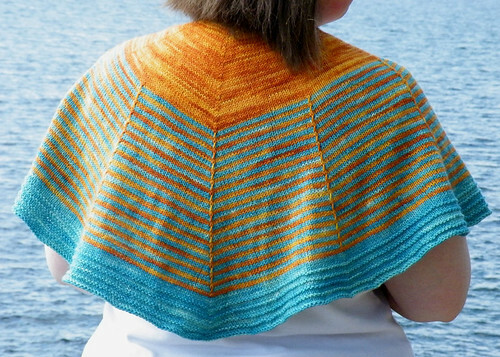 I knew the color combo would look amazing, but this is definitely a gorgeous shawl. Great, great job. I’m off to Rav to favorite this, cause I’m so in love with it. I love this!!! orange with turquoise is one of my favorite color combos.!!! This looks just lovely and You look fabulous wearing it!!!! Oh, that’s so pretty. Love the colors! ;-)?). Anyway, you did a perfect job of combining the two — lovely! You are seriously too cute! Love the shawl! Hey there! I clicked on your ‘visited’ link from my blog and boy was I in sheer happiness! Then I clicked on Daybreak. And I tell you, the first thing uttered out of my mouth: Wow! That is one stunning color combination! You’re one talented knitter. Keep it up! And I’ll visit often. p.s. your other projects were all awesome as well. 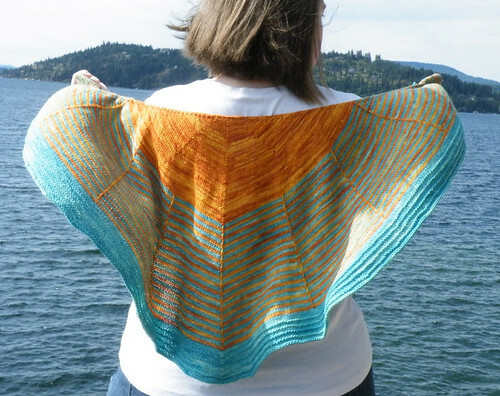 this is the shawl that inspired me to do mine! love the colors and how you put them together! just did mine in 2 colors tho. didn’t know it was yours! how fun is that!